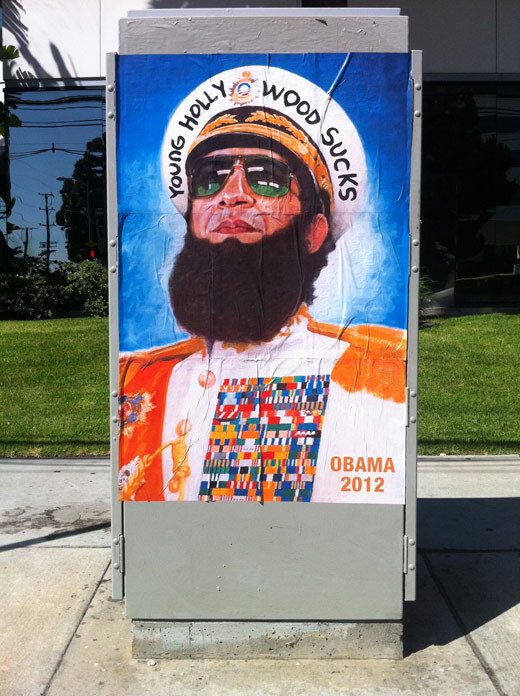 Sacha Baron Cohen's movie "The Dictator" blew but my poster making fun of Obama that I made based off it's movie poster didn't. How can I buy one of your originals? Dude…I want an opportunity to buy all of these posters. Why are they illegal? What happened to free speech? You have a right to an opinion…as do I…and you are seriously talented…I even live in L.A.! I want to support your cause! Amen, brother! I would like to decorate my entire home with this incredibly spot-on artwork! We live under a dictatorship; the bastards have taken away most of our rights and are trying to take all the rest. Big Brother is watching. It’s NOT a 6 pointed Star of David. It’s a pentagram, the connected 5 star of Evil. I must say, it looks VERY appropriate on Obama. This guy SABO is a genius with his political commentary and art. Excellent work. 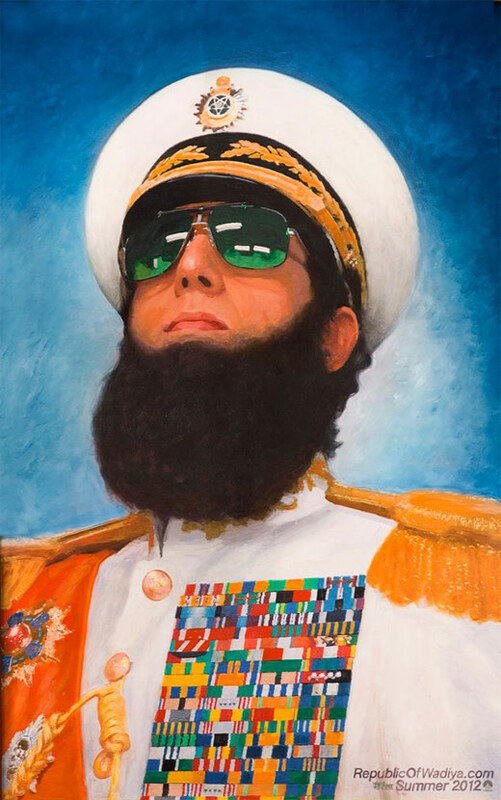 I get the Islamic dictator connection between Obama and this picture but I don’t understand why the hat has the Jewish Star of David on it. It isn’t the Jewish Star of David as that is a six pointed star. The star on his hat is and upside down pentagram which has completely different implications. Obama has no idea what he’s going up against chnlleaging the Clinton machine. His unfavorables will soar once Hillary’s surrogates get done smearing him .and given that he has yet to face any serious opposition in any of his previous runs for elected office, it’s unlikely he’ll know how to effectively respond when his back’s up against the wall. Obama is definitely a factor in this race, but Hillary is still the frontrunner, much as it pains me to say it. John Edwards has some built-in advantages, but I suspect the immigration issue will be his achille’s heel. Edwards will be walking a tightrope right away as he tries to simultaneously court favor from the industrial unions that dominate Iowa’s caucuses and the service unions that dominate Nevada’s caucuses. The latter demographic wants lawless immigration policy the former does not. And even if Edwards threads that needle, he has a broader immigration problem in that his likely support for comprehensive immigration reform directly conflicts with his primary campaign theme of reducing domestic poverty. If comprehensive immigration reform becomes a reality, poverty in America will increase .and increase substantially. Edwards will have a big problem trying to talk his way out of that double-edged sword.While there is tremendous (and legitimate) worry among Democratic voters that Hillary is unelectable nationally, her well-oiled machinery is likely to be as ruthless as George Bush’s was in 2000, all but guaranteeing her the nomination and crushing any obstacle that stands in her way. I’m already convinced that Obama will be on the receiving end of the same hit job that John McCain was in 2000, only at the hands of Hillary. However, the bloodthirsty spectacle that BushRove got away with in 2000 will not be as successful for Hillary, further staining her hands.But barring a Giuliani nomination on the Republican side that would ensure a third-party challenge from the right and put every Southern state on the table, Hillary and Obama would both be defeated in November 2008. If the Republican nominee is Romney, McCain, or any number of second or third-tier GOP contenders, I can’t see a single red state from 2004 turning blue. Iowa or Colorado could conceivably tip blue for Obama (though it wouldn’t be enough for him to win), but neither of them would tip for Hillary. Both candidates would likely lose a couple of blue states to either McCain or Romney.As for the GOP field, I think their safest bet, based on my limited knowledge of his political profile, is former Arkansas Governor Mike Huckabee. With George Allen and Bill Frist out of the way, he’s the only Republican in the race who seems capable of averting the GOP civil war, bridging the chasm between the values voters and the robber barons. Gingrich and Brownback would be too scary to the Greenwich, Connecticut, crowd and the party’s campaign coffers would suffer for it. If I was a Republican activist, I’d be looking pretty seriously at Huckabee right now. Time warp? Either that or you’re clinically insane. I don’t want everyone to vote. I only want ironfmed voters to vote. People that vote based on “feeling” have no business in the booth. I was making calls the other day and here is how the conversation went:Me: I am calling on behalf of the local Republican campaign and I am reminding you to vote on Tuesday.Voter: Is John McCain a Republican?Me: Yes maam.Voter: Then I want you to know that I voted for Obama.Me: Thank you and have a great week.Okay, if you do not even know what party the candidate belongs to, you should not be voting. Voting in ignorance is worse than not voting at all! I have co-workers that are voting for Obama but at least they can articulate why. They are liberal and they want higher taxes on the upper class and they want more restrictions on big businesses. I don’t agree with them, but I respect the fact they know why they are voting. Koko LaRue, I believe that star on his hat, having 5 points, is a pentagram, representing Satan. The star of David has 6 points. If these works were available for purchase, the artist would never have to worry about money again. I’d like to see you do a take off on the Che Guevara poster that so many useful idiots wear on t-shirts. They idolize this monster because they think it’s so cool while knowing nothing about who he really was. Drives me crazy. I’d love to see something “in your face” that exposes what he really stood for. Thanks – Love your work – Keep it up! I wonder If the innratel Demacratic showdown is going to be between Senator Clinton and Senator Obama, the Democrats are going to lose out either way. It is going to be portrayed as what the Democrats consider to be more powerful in terms of voter attraction: the chance to send the first African American into Presidency or the chance to send the first woman into Presidency. In other words, if things come down to a Clinton vs Obama fight, the Democrats can take their pick whether to alienate women voters or black voters.If, on the other hand, the Republican party wanted to join a nice little socio-political experiment, how about sending in, say, a Latina to run for President?But jokes aside, what is your take? Is this gender vs race thing even gonna be made an issue? Or is it one already?J. Too much Star Trek, comrade? It’s all spin. It started with Slick Willie crniyg aobut the contests being to close and attacking Obama, then moved to the Clinton campaign lowering expectations, so that any kind of showing looked positive. you have to keep in mind that the Clinton’s are the masters of spin and painting the picture they want though their resources and attacking those in there way. Did anyone else notice how carefully George Stephanopolis tiptoed around his conversation with Hillary in her interview with him and avoided responding to her references of when they worked together during Bills first term? He knows from experience what the Clinton attack machine is capable of. Don’t worry her campaign focus will change again and again as long as she is in the race and the polling tells her what is popular at the time. I would love to see your art showing the parallels between Nadya Suleman -aka- “Octomom” with her 14 children to Obama’s created child immigrant border crisis. The pentagram on the cap is appropriate. There is an obscure Australian blog page that shows the dear leader with an Alleister Crowley shirt on while having a photo op with a young student. It is not any photochop either. Here are a few more lies & sources from the false messiah.